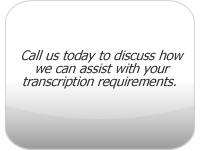 Sydney Transcription Services is an outsource service specialising in digital and analogue transcription, data entry and general wordprocessing. Our aim is to deliver you accurate, high quality documents in a short timeframe at a reasonable cost, along with the complete assurance that your information will be handled in the strictest confidence. In business since 2003, we have grown to the point where we now provide transcription and wordprocessing support to a large number of very diverse businesses and individuals, not only in Sydney but Australia-wide and internationally. Our superb team of transcriptionists are carefully chosen for their strong English language skills, excellent general knowledge, typing accuracy and their years of experience in their respective areas of expertise. We offer a friendly, personalised service and would like to become the name you think of when it comes to reliable, high-quality and confidential transcription services.